Perfect for artists in training Learn to Draw Cats & Kittens is the perfect way for children to discover more about their favorite animals and pets, in addition to expressing their artistic side. 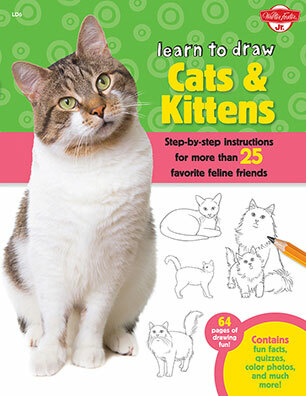 Perfect for young artists-in-training, Learn to Draw Cats & Kittens offers a comprehensive drawing experience that includes step-by-step lessons, as well as full-color photographs, fun facts, trivia, quizzes and much more. Children will enjoy the 64 pages of drawing instruction for a variety of feline breeds, including a Bengal, a British Shorthair, a Persian, a Ragdoll, and a Sphinx. The book opens with brief information for getting started and the most popular breeds, the tools and materials needed, and some sample drawing exercises to warm up. Each drawing lesson begins with a basic shape, such as a square, a circle, or a triangle, and progresses to a finished colored piece of artwork, making it easy for children to follow along. Along the way, engaging text describes interesting facts about each breed. With a mix of art instruction and engaging information, Learn to Draw Cats & Kittens is the perfect way for children to discover more about their favorite animals and pets, in addition to expressing their artistic side.